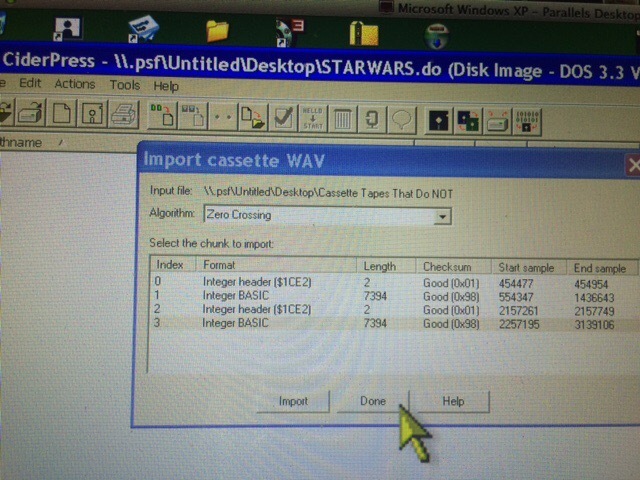 Today, I wanted to re-create the Cassette program loading process on the Apple lle. Referencing my old write ups. I hooked up an audio cable to the input jack plug on the Apple IIe (the plug closest to joystick plug), and the other end into the out or earphone or speaker jack on the Cassette player. Hit control reset to get the basic prompt. Typed NEW and hit return. Started play on the Cassette player and then immediately hit return. When the program finishes loading the IIe beeps again and gives you a basic prompt. I then hit Stop on the Cassette player. I performed a LIST on the IIe to see the program listing. In my case it was the program Lemonade by Apple. It is a long program and took over a minute to load into the IIe. Note: the output volume from the Cassette player must be very high in order for the IIe to pick it up. For me, the volume must be at a point where it is annoying. Below are my original write ups from 3 years ago with various attempts to load programs, Cassette, Wav or other formats. I tried a number of sites. These write ups predated this blog so I’m adding now for anyone who wants to read. This is a nice exercise to go through to understand and experience the pre-floppy load process back then. 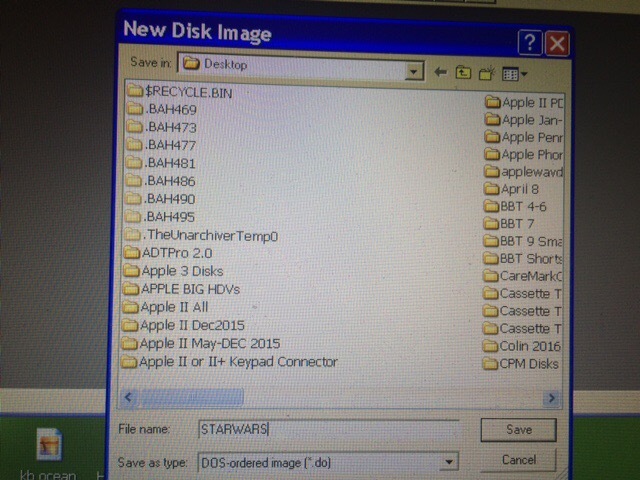 But most, if not all these Cassette programs are available as dsk images now. Here are a couple of pictures of saving and reloading to B side of cassette tape. I used the cassette player today to LOAD the Lemonade Game from the Original Tape, then SAVE it to a new blank cassette. It worked like a charm. I was able to LOAD the game from the new cassette and RUN it…multiple times. Today I tried using Virtual II emulator on my MacBook Pro to play some cassette images from the brutaldeluxe.fr site. 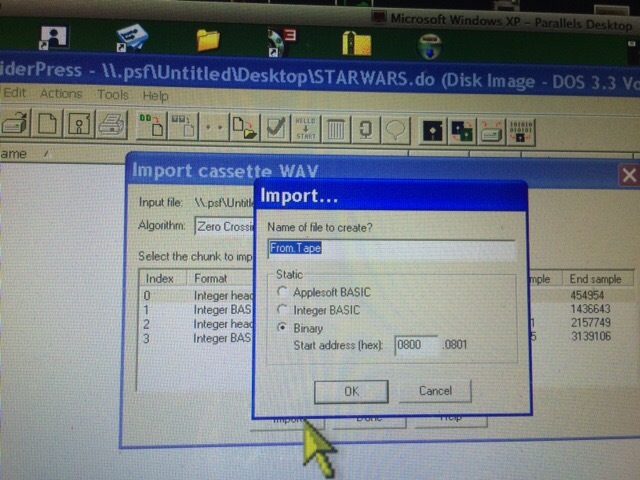 But, first I had to convert the wav file to a .do disk image file so it would run on Virtual II. 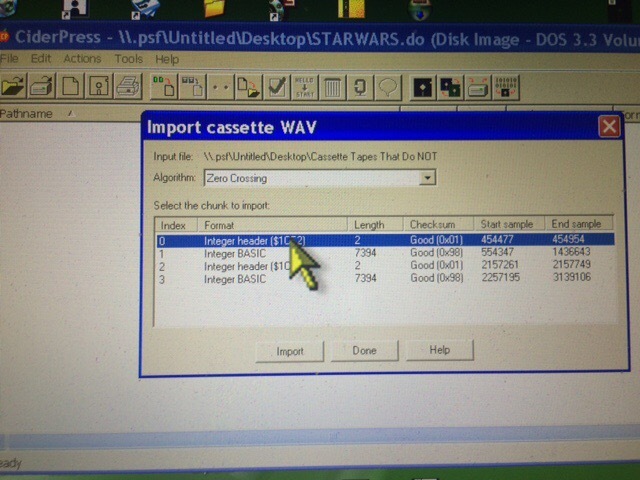 Trying to load the wav file or aiff file directly using the cassette feature of Virtual II would just not work as it wouldn’t allow me to select those files. So, based on something on read on the Virtual II site, I think, I changed the extension of aiff to cass. These were then available to Load using the Cassette selector feature. However, I would get a ERR when I tried to load these about 10-15 seconds into the LOAD effort. After a control reset to get to the prompt I performed a LIST command. Some code was there but it was pretty. 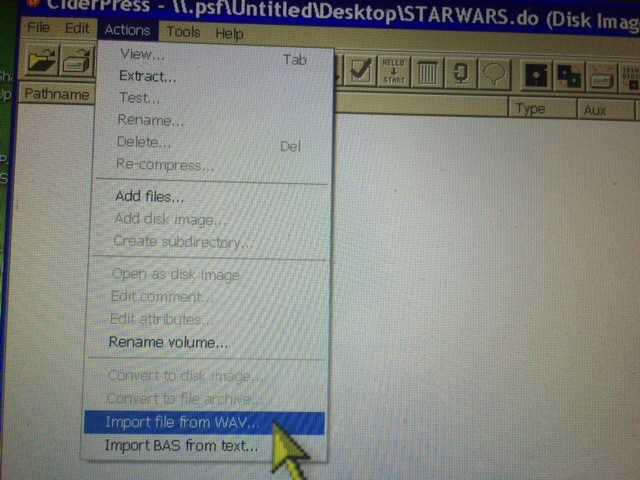 So, instead I used CiderPress to: 1) create a New Disk Image (a .do image) 2) Then from the Action dropdown I select Load from wav file to that image 3) You then select the wav file and Ciderpress opens the contents. The contents are lists and could be Integer Basic, Binary or AppleSoft. 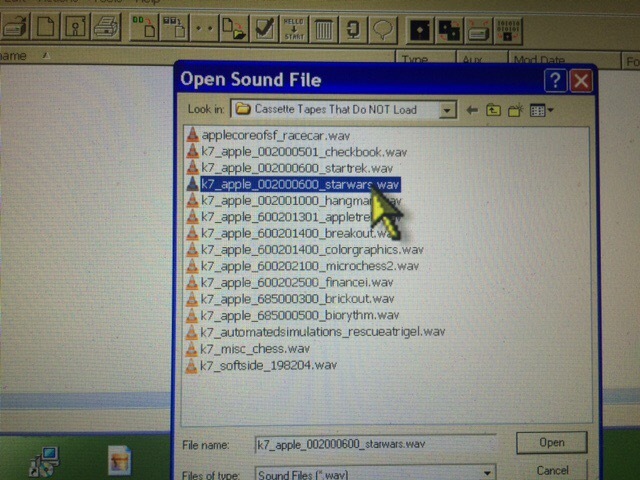 I could only find one program/wav whose content was AppleSoft. This was the Address File Database Program. 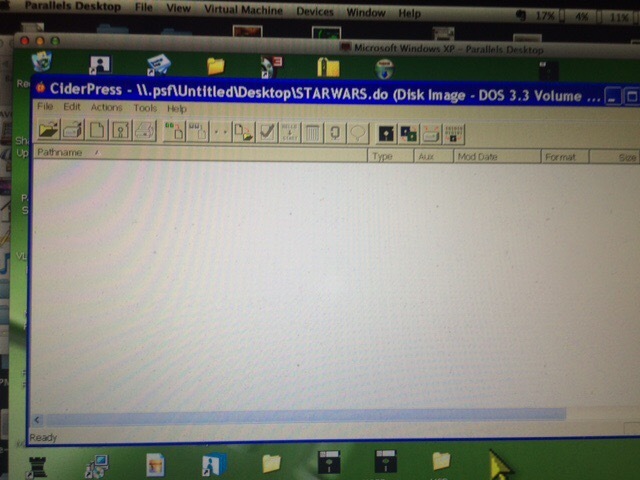 Once you insert the AppleSoft Program in the .do image you can double click on the .do and it will boot up Virtual II. From there you CATALOG the disk and then RUN the Program. I ran the Address Database Program and created two Address File Databases called Chris and Computers. The first was actual addresses. The second was a Database of Computers. The other .do programs I got to run were Binary image programs within the wav file. These were Text Adventure Games, which included a sample Adventure Game and Mission Impossible Adventure Game. The other .do image I created contained Integer Basic programs. These I could not get to run. I probably need to have Integer Basic loaded. The wav files contain Integer Basic but I didn’t try to combine it and a game program on the same .do image. Maybe I should try that and run Integer Basic before trying to run the Integer Basic Program itself. Perhaps tomorrow. I went to the Asciiexpress.net site which has old Cassette Program images written for the Apple II and Apple II+ which you can stream and LOAD directly into IIe and RUN. I used Firefox on MacBookPro to download. Hit load and click play on screens. When streaming from this site the IIe starts reading file and in a few seconds displays ETA on completing the load on the screen. I streamed/downloaded and played Draw Poker and Moon Patrol. When done playing I hit control reset as I wanted to get to a Basic [ prompt so I could list and save the code. It was a no go as it went to an asterisk prompt. Also went to the brutaldeluxe.fr site to download/stream into the IIe wav and aiff data files. But all of them produced an error at 12-14 seconds into download. Don’t know why it does this. When you enter LIST some code is displayed. I was successful in loading the Lemonade Game from Cassette with the IIe today. I also loaded the Hoppalong Cassidy on the reverse side. You have to connect the cable into the speaker out plug on the cassette player and the other end into the plug furthest to the right on the back of the IIe…right next to the Joystick. It took some doing to figure it out. It turns out it’s much simpler on a IIe since it boots to a basic prompt [ . The computer will beep once to say it begins reading the program. Then when it’s done reading it will beep a second time and return you to the basic prompt [ . Then you can type RUN to start the game or type LIST to see the basic code. I repeated the LOAD, RUN process a few times. Copies of Cassette Programs: Since the input is analog song I found a site on the net that actually provides sound files you can play into the port, I’ll have to try some of these. http://www.brutaldeluxe.fr/projects/cassettes/index.html has many of the old Apple Cassette programs on it’s site. They are in wav file format compatible with playing them from your computer directly into your input port of your Apple II, Apple II+, and Apple IIe via the [LOAD and [RUN commands. 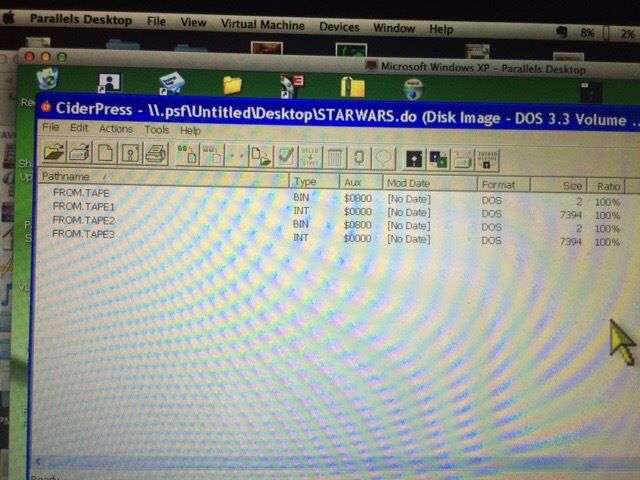 However, you can convert these wav files to .do images which can be played in an Apple II emulator such as Virtual II. I run Virtual II on my MacBook Pro. The program you need is called CiderPress. It runs under Windows. 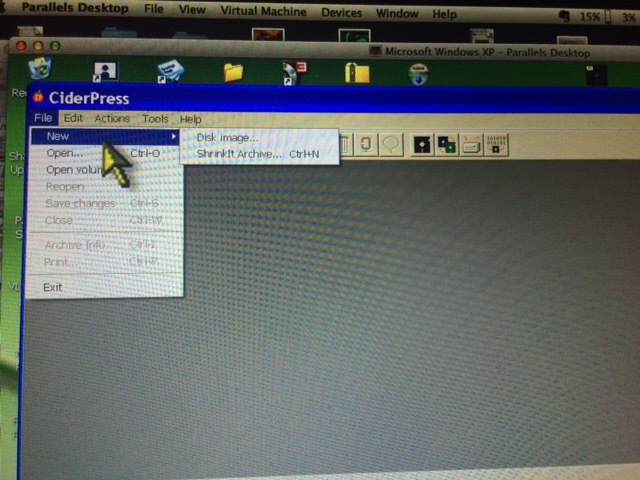 I run Windows XP under Parallels on my MacBook Pro to perform these conversions. The following are the sequence of pictures for creating the .do from .wav file. 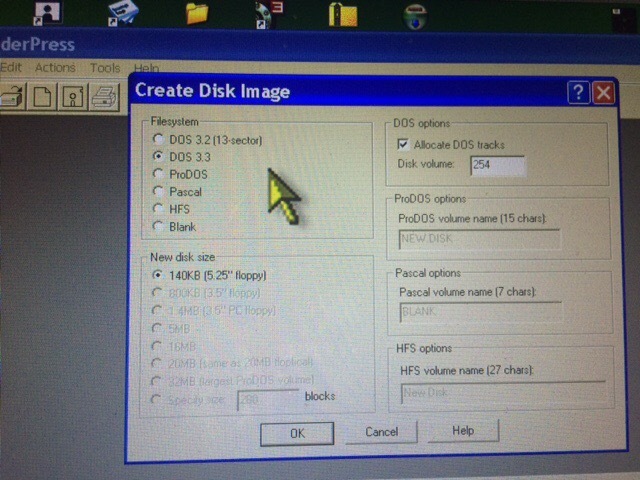 As you can see from the pictures I didn’t spefically name any of the basic programs and just let the default From.Tape. However, on subsequent imports I name the program on one of the basic tracks…like Lunar, or Maze which are just two of the 20 or so files I’ve converted. You are currently browsing the archives for the Cassette category.